George Mason College had barely been in its permanent home at Fairfax one year when it was asked to radically change. It had been determined by experts conducting studies for the Virginia government that the Commonwealth of lacked the necessary educational infrastructure to handle the growing number of college-age and soon to be college-age citizens. The small college which enrolled only seventeen students eight years prior would be required to become a four-year degree-granting institution and grow very large in a very short amount of time. It would become independent within the next seven years, and it would have to plan for an enrollment nearly one thousand times that of 1957 within the next twenty. In 1965 Virginia’s Higher Education Study Commission conducted a study of the efficacy of the Commonwealth’s higher education system. In December of that year the commission released a 206-page report with recommendations for the improvement of the state system. Known quite simply as the “Russell Report” after the commission’s director, John Dale Russell, it suggested that certain areas of Virginia, such as Northern Virginia, were not being adequately served by the current arrangement of branch colleges. It went on to recommended that some branch colleges of the University of Virginia become part of the Commonwealth’s new system of community colleges, while others become independent four-year institutions. George Mason, the report suggested, should become a new state university for Northern Virginia. The Russell Report was released just prior to the start of the 1966 Session of the Virginia General Assembly. James M. Thomson, delegate from Alexandria and a contributor to House Resolution 5, which in 1956 established George Mason College, introduced a bill to make it a four-year degree-granting institution. In passing this bill, known as H 33, and other legislation that spring, the General Assembly enacted sweeping reforms on the Commonwealth’s system of higher education. George Mason College was removed from the University’s community college system of two-year branches, and other branch community colleges were placed under state control. Mason became a four-year liberal arts college granting degrees under the aegis of the University for the time being. That too would change in six years. With both the departure of Director Robert Reid and the General Assembly’s advancement of George Mason College to a four-year institution occurring in March 1966, the University created a new title and job description for the chief executive of George Mason College and brought in a new individual for the job. Lorin A. Thompson became Mason’s Chancellor on June 1. Thompson was part of the University’s Graduate School of Business Administration and had over 20 years of planning experience, heading up the university's Bureau of Population and Economic Research in Charlottesville. As Chancellor he would report directly to the University’s president, Edgar F. Shannon. Shannon gave him the mandate to expand George Mason College, both physically and educationally. This seemed not to come a moment too soon, as enrollments steadily increased (356 in 1964, 577 in 1965, and 840 for the fall of 1966). The original four buildings were designed and built to comfortably accommodate from 500 to 750 students. EXPAND THE CAMPUS TO 600 ACRES TODAY! THE LAND WILL NOT BE VACANT TOMORROW! Chancellor Thompson took report’s findings seriously and set about how to make this happen. He and the Board of Control recommended the following division of land costs among the local governments, based upon population: Fairfax $1.6 million; Arlington $850,000; Alexandria $495,000; and Falls Church $52,000. The City of Fairfax was not asked to contribute because it bought the original land and financed the sewer facilities. Thompson prepared a slide show detailing Mason’s land needs for continued growth and took the traveling slide show to citizens and elected representatives of the four local municipalities. He suggested that by collecting $4.50 (the cost of a steak dinner at the time) for each resident, Northern Virginia could build George Mason College into a regional university. Thompson succeeded in convincing the local governments to fund Mason’s expansion. Falls Church appropriated the funds that summer. Fairfax and Arlington Counties placed bond referenda for the funds on their respective November ballots, and the City of Alexandria appropriated the money in November. The Board of Control then began the process of purchasing the necessary land. To assist them, the Board hired a local attorney who specialized in eminent domain and land condemnation, John T. “Till” Hazel. 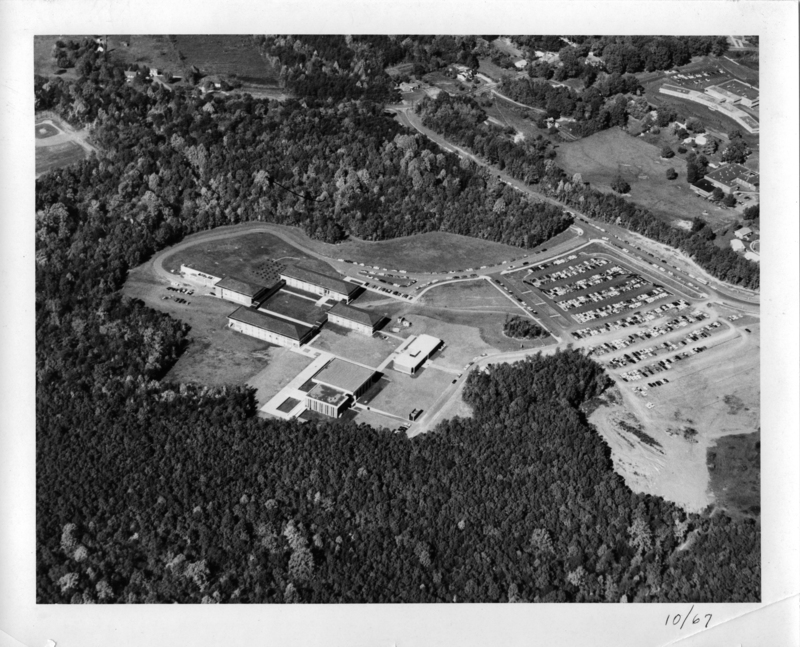 Hazel helped the Board secure the more than thirty individual parcels of land totaling 421 acres, the last of which were officially transferred to the college in a ceremony on July 18, 1969 attended by Governor Mills E. Godwin, Jr.
As the University began amassing the individual tracts of land which surrounded the original 147 acres, planning for the new George Mason College began. By January 1967 the initial master plan drawn up only seven years prior would be obsolete, as it called for a maximum enrollment of only 2,500. Given the estimates in reports disseminated by knowledgeable individuals in 1965 and 1966, University officials were expecting future enrollment to top 15,000 by 1985. Thus work began on a new master plan for 1968. The University hired the architectural firm of John Carl Warnecke and Associates of Washington, DC. The 1968 Master Plan was the architectural complement to the 1968 Educational Plan, which proposed to divide the student body into six cluster colleges of 2,500 students each. A college would be oriented toward a particular discipline, and would contain teaching space, dormitories, and a student union to serve the students in that particular college. Professional programs, such as business, engineering, nursing, and education would join traditional academic ones, and the Northern Virginia Center of the University of Virginia at Arlington would be moved to George Mason in Fairfax. Later it would eventually become part of George Mason. The 1968 Master Plan proposed that the individual colleges be built around the original four buildings, with Fenwick Library serving as the main focal point in the center. All college academic buildings would be surrounded by an inner ring road with parking facilities placed outside of it. The first cluster college would be finished by 1970 and would include the original four buildings, and the new planned Arts and Sciences Building (today known as Thompson Hall). The final college would be completed in 1985 when the enrollment would reach 15,000. The main entrance to George Mason would be at Ox Road (Va. Route 123). The entrance road would terminate at the center of campus where the Administration, Fine Arts and Continuing Education buildings would be located. This design was meant to attract the Northern Virginia community and have them interact with the college by attending concerts or performances in the Fine Arts building or classes in the Continuing Education Center. By the 1967-68 academic year enrollment was up to 1,128, four times as many students as the college drew in its first year at Fairfax, only 3 years ago. Crowding was relieved in the fall of 1967 with the new free-standing Library and Lecture Hall buildings. Spaces which once housed these two functions were opened up for new classroom space. The Library measured 31,000 sq ft, had a capacity of 31,000 volumes and reading facilities for 500 users. It was built at a cost of $1.2 million, which included a $373,333.00 federal grant. Students helped move most of the 20,000 the books over from the East Building when the library opened. It was dedicated in December 1967 and named for state senator from Arlington, Charles Rogers Fenwick. The Lecture Hall, also completed in December 1967, featured a 325-seat auditorium and two lecture rooms each with a capacity of 100. This would give George Mason College a dedicated place for meetings, seminars, workshops, and other programs. The Lecture Hall had been originally removed from the 1964 build-out as a money-saving measure. To continue forward progress, Chancellor Thompson stepped up the budget requests in 1967 and asked the 1968 General Assembly for $9.7 million (of which the Assembly agreed to $4.3 million) for the 1968-70 building program and $30 million for capital outlay projects for the next 6 years. Mason looked to use the money to build the Arts and Sciences Building (today’s Thompson Hall), a Physical Education Bldg (now known as the RAC) and new science labs. Mason was also authorized by the General Assembly to issue its own bonds to finance construction of a Student Union (which would eventually be built in 1974, and is now known as Student Union Building I) and two dorms in the future.